Oh, okay. Thanks for the answers. No, saw the money in the Roman one. Hopefully, you can add to them in the future, esp the WWII one. :) Finding a use for money would be cool too. You and your family have great Holidays too! Each game says, "The full version of the game has more available battles and will be updated..." except the full versions are the exact same battles as the demos. Thanks. Looking forward to all four of them. Well, I've always run it from the desktop. Using your (older) Java seemed to make it work! New: when I took the screens, both games crashed to desktop. 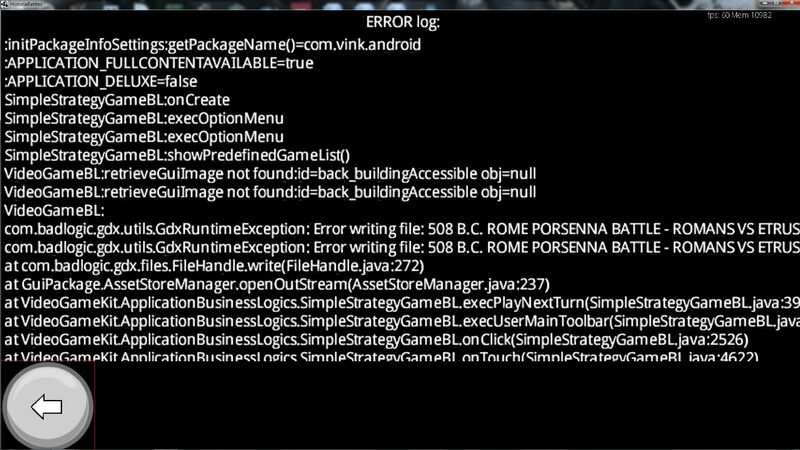 It doesn't crash and exit, it just shows a huge error log. Next time, I'll grab a screenie of it. Version? They're demos, so whatever version those are. Thought I'd try them before buying. Downloaded both this one and the Rome demos. Every time I hit End Turn, I get an error log. Every time, both games. Great game! Only reason I look forward to the Steam release is because I use Steam all the time. Maybe I can get a whole 3 minutes through Steam too! I had read the Trello roadmap. Oh, I read it as Early March. Is that correct? Understand no shifting economy yet, but there's no terraforming at all yet? No raise, lower or flatten? Thanks. Oh, that makes more sense. Whew. Okay, so what I'm taking from that is: static maps, the rest of the game in DLC, right? Since the original has random gen, figured you already knew how to do it. If you bought the game on Desura, you can still get Steam keys. Steam on Steam would be a good idea. Don't really know how Itch works. We easily, and by far, prefer massive procedural galaxies/planets. Plus, you should consider offering a discount for owners of SM1.